She is her own woman, a singer, songwriter and performer whose ability to transcend genres echoes the tradition of her mother, musical icon and pioneer Nina Simone. Blessed with a rich vocal range, an innate skill for lyrical interpretation and a soul-deep understanding of music as a means of healing, empowerment and celebration, Lisa Simone is very much her mother's daughter while assuredly a multi-talented artist in her own right. The daughter of..started her career serving her country in United States Air Force for ten years and is a veteran of the first Gulf War, before making her theatrical debut in the touring company Jesus Christ Superstar, in 1994. Broadway quickly followed. Lisa joined the original cast of the multi-award winning Broadway Musical, RENT. Simply known at that time as SIMONE, she took out its First National Touring Company in the role of Mimi Marquez, which garnered her nominations for both a Helen Hayes and Jefferson Awards, as best actress in a musical. After RENT Simone became a member of the Chicago acid jazz band, LIQUID SOUL receiving a Grammy nomination for their album HERE'S THE DEAL before returning to theatre in AIDA (a role she helped originate along with the role of NALA in LION KING). Her critically acclaimed performances in the leading role of AIDA, on the First National Tour, earned her the NATIONAL THEATRE AWARD - voted on by fans nationwide - before returning to Broadway's Palace Theatre, to critical acclaim, until the death of her mother, Dr Nina Simone, in 2003. Lisa proudly counts herself as one of her mother's biggest fans, and made sure her first solo album SIMONE ON SIMONE, released in 2008 making an impressive debut on the jazz charts, was a big band tribute to, as Lisa puts it "The Great One who walked before me." In 2009, Simone joined Odetta, Tracy Chapman, the late Oscar Brown jr, and Liz Wright on the Carnegie hall stage to honor her mother in SING THE TRUTH. STT soon went on the road and Simone was joined by Dianne Reeves, Angelique Kidjo, Liz Wright and Patti Austin, touring with Nina's original band members throughout Europe, and the Southern Pacific, including the coveted Sidney Opera House. Lisa currently divides her time between France and the United States, and is constantly on tour, headlining everywhere she appears. Since moving to France in 2014 Lisa has not only released two successful albums, her star has risen quickly and continues to blaze. Whether grooving to her own songs or swinging with Big Bands in Tromso, Elmhurst or Germany's famous HR Big Band, Lisa is proud to carry on the legacy her mother began, with joy. While touring Europe with her trio, in support of her two personally penned albums ALL IS WELL, and MY WORLD, Lisa recorded the live album, LISA SIMONE LIVE AT THE EDGE, with the Tromso Big Band, over two nights, to sold out audiences in Tromso, Norway. At the same time she was recording live in the land of the Aurora Lights, "WHAT HAPPENED MISS SIMONE", the documentary on the life of her mother Dr. Nina Simone, which Lisa founded and executive produced, debuted at Sundance. The documentary is, what Lisa calls "a daughter's promise to her mother fulfilled," and garnered 18 nominations, including an Oscar, and 6 wins, including an Emmy for OUTSTANDING DOCUMENTARY. 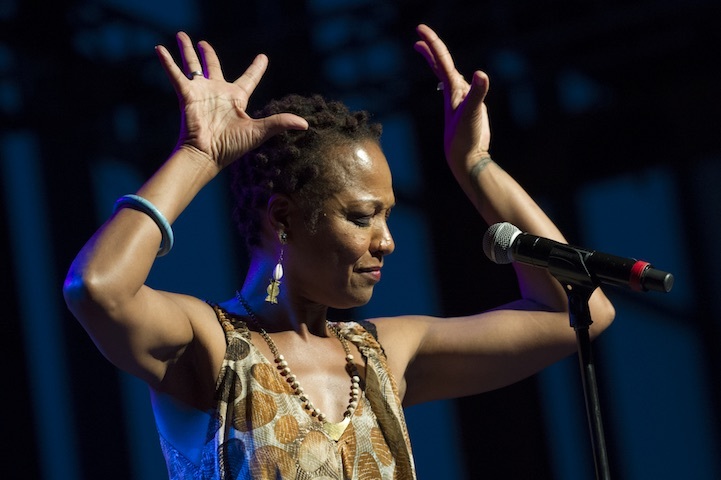 From New York's Lincoln Center and Town Hall to jazz festivals at Telluride, Montreal, North Sea, Marciac, Cully, Vienna, Montreal, and The Olympia, Lisa Simone's charismatic personality and ability to tell a story through song has captured the hearts and souls of audiences worldwide. With the release of her first full-length album 'Simone On Simone' in May of 2008 Lisa exposed to a worldwide audience the vocal dynamism that live audiences have been experiencing for decades. Using her mother's charts as a beginning Lisa Simone forged a musical path with the help of her former twenty piece big band, the Rob Stoneback Band, to create an album that honors her mother's musical contribution while it also began a new chapter in her own musical career. A decade later Lisa Simone reunites on stage with the same musicians in the same town to recreate the album live for an intimate look at their journey. "She has formidable vocal chops, much of which were honed from years of performance on Broadway shows such as Rent...Aida...and, most recently, Les Misreables." "Does Simone really have the vocal chops to survive comparison [to her mother]? The answer is yes." "The new interpretations take some getting used to...but you can't argue with Simone's stunning vocal turn on "Feeling Good."